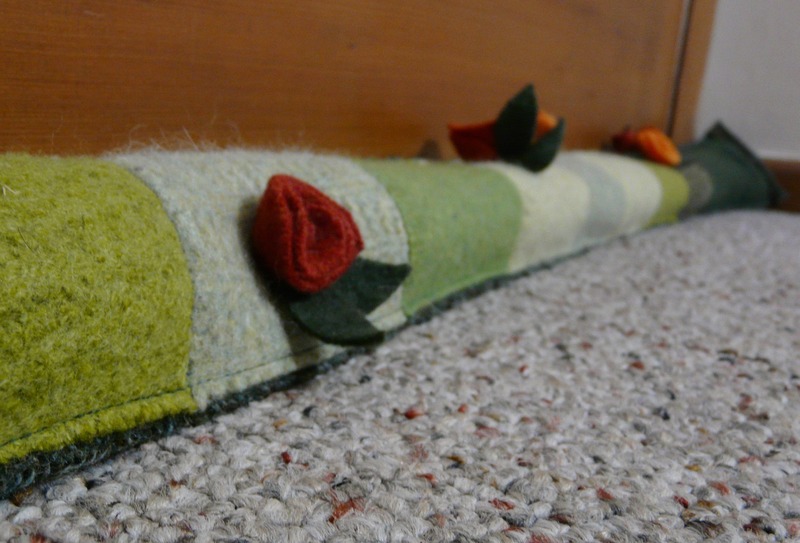 For fun in recent months I’ve tried a couple “extracurricular” projects out of felted wool. 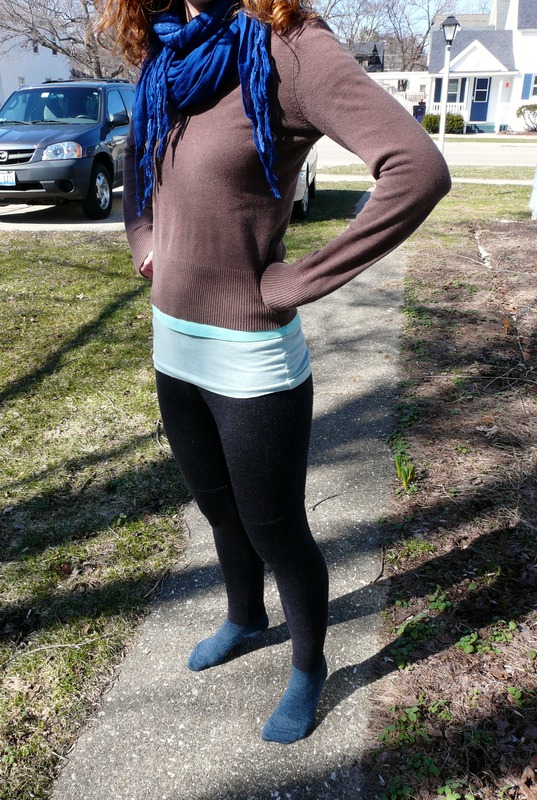 The first was a pair of running leggings from Resweater, the blog of a fellow felted-wool-lover. I made a pair for my daughter who runs — and she runs year-round in western Michigan, even when there’s snow on the ground. Resweater blogger Kris has given us a very helpful tutorial here. So what started out as a man’s XXL merino wool sweater is now serving in a whole new capacity as comfy, breathable leggings. Grace says they keep her warm and dry and they don’t smell afterwards :). Thank you for the great idea, Kris! Now it’s a veritable garden to ease winter’s bleakness and usher in the hope of spring, right? I used this tutorial at prettyhandygirl.com to practice making flowers. Fun! I sewed a flat pocket with a velcro’ed flap at one end. It was lightweight and simple to send through the mail, and upon receiving it, my daughter filled it with dried beans from her pantry and put it to use. I need a few of those draft dodgers! Oh, Gloria, you are always an encouragement to me. You just say the word (and the color), and I can whip up some draft dodgers for you, too. Have I yet mentioned that I’ve been saving up some lovely lavenders for you? Well, I have…! Awww, that is an adorable draft catcher. I love the stripes. Thank you for linking to my tutorial. Those pants look great! I made the mistake of wearing synthetic pants last night jogging, and I was freezing. I kept wishing I had my wool ones on! I love the draft dodger too. What did you use to stuff it with? Hi, Resweater! Thanks again for the great pattern. As for the draft dodger, I gave it a recloseable end (with Velcro) so it could be mailed without “innards” and then filled by the recipient with something like rice or beans. 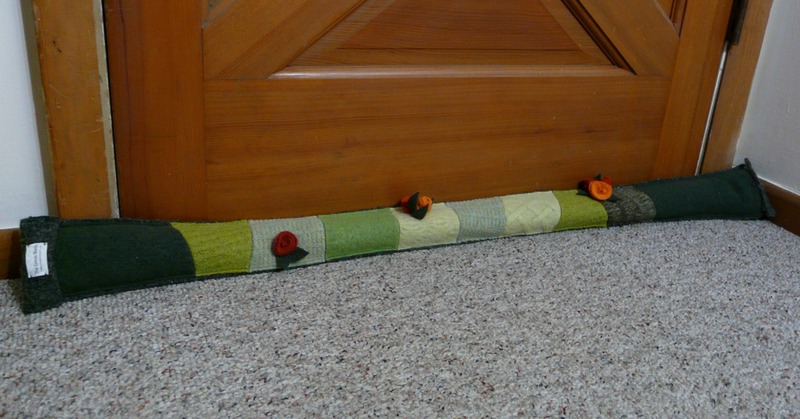 My daughter used beans — which hold it in place nicely by the door.